I continue to be amazed at how we can retain certain memories all of our lives. Every small detail of certain places or events stays with us – to be recalled and enjoyed whenever we want. 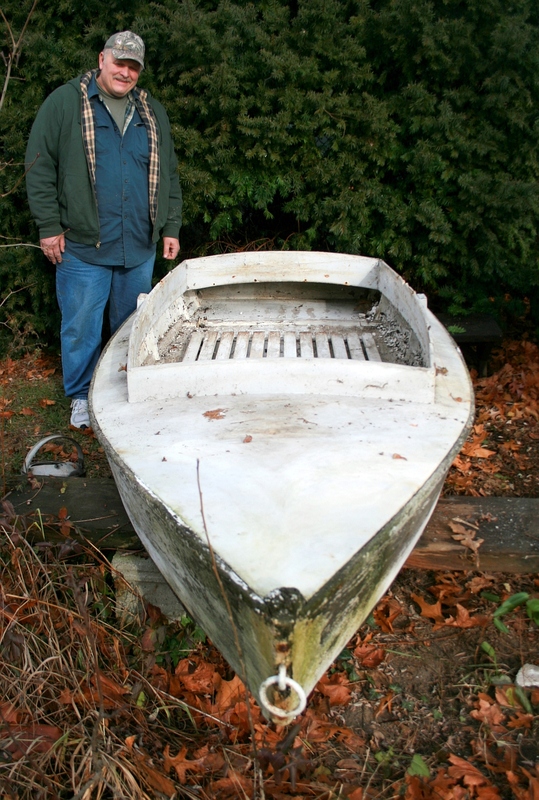 The first time I ever saw this boat – the 2-man “Scooter” belonging to Charlie Horal – is such a memory for me. 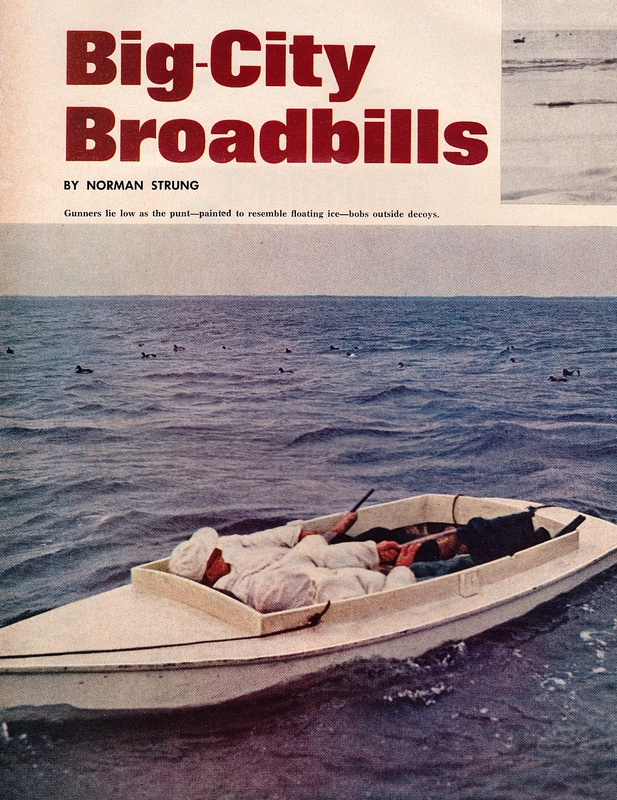 Although I did not shoot out of her at the time – I think I was about 9 and so the year was about 1962 – I spent the day observing a classic “big rig Broadbill hunt” on Great South Bay. Charlie was a life-long friend of my Dad’s. For most of my life he owned a gas station in East Islip – the south shore town where we lived; it was a Sinclair station at the time. He always had a big rig – which on Great South Bay in that era meant a big cabin boat to serve as the tender or “mother ship” and at least a gunning boat. 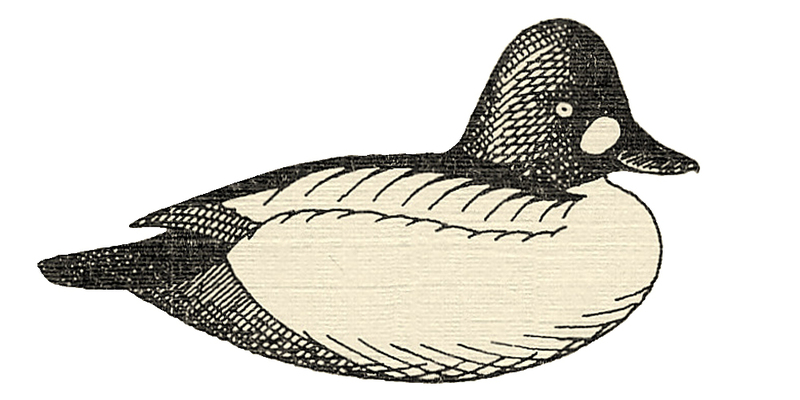 Many such rigs also used a third vessel – known as the stool boat – for storing, setting and picking up the decoys. 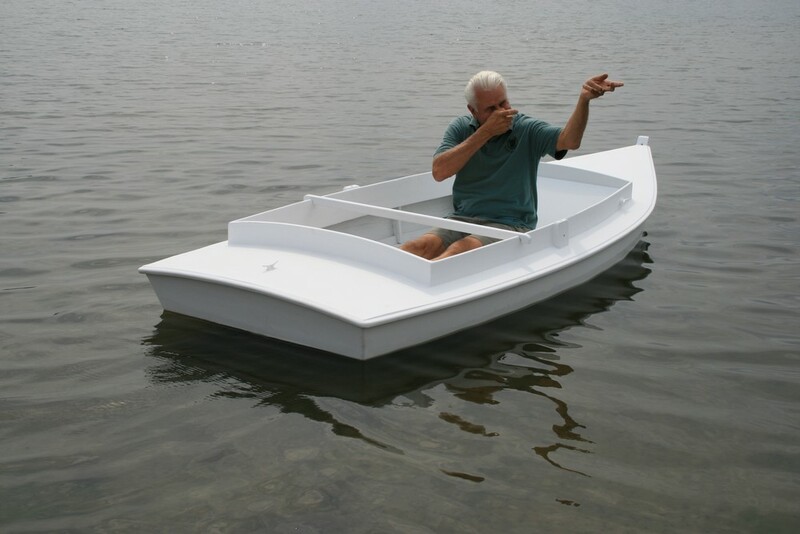 The stool boat could also be used to ferry gunners between the scooter and the tender as they took turns shooting. We used the term Scooter loosely. 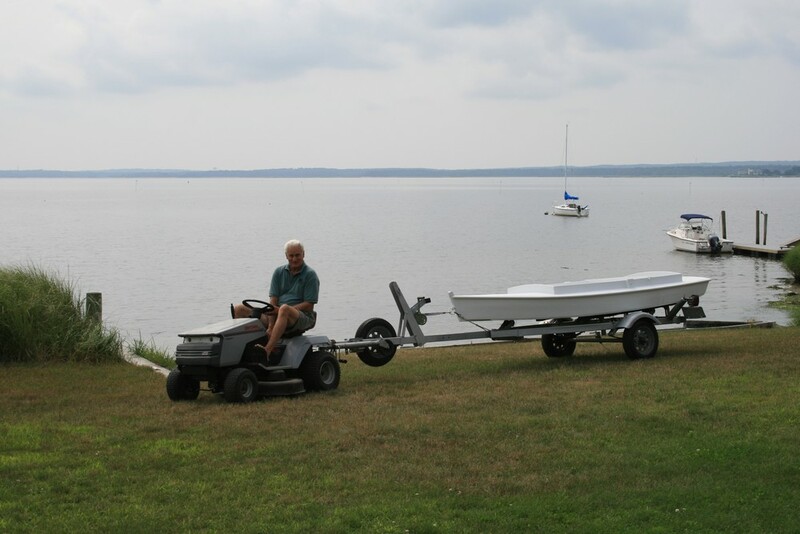 The original Scooter was developed at the east end of Great South Bay – on Bellport Bay in the mid-1800s by Captain Wilburn A. Corwin. 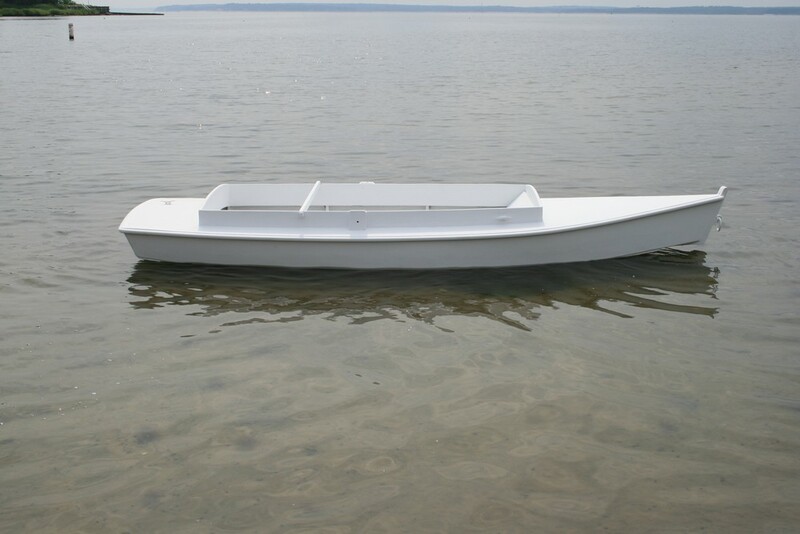 Shod with a pair of metal runners – first iron then later brass – the Scooter was designed to cross saltwater ice by dragging, piking or sailing – and also to cross open water with a pole, a pair of oars, or a small sailing rig. 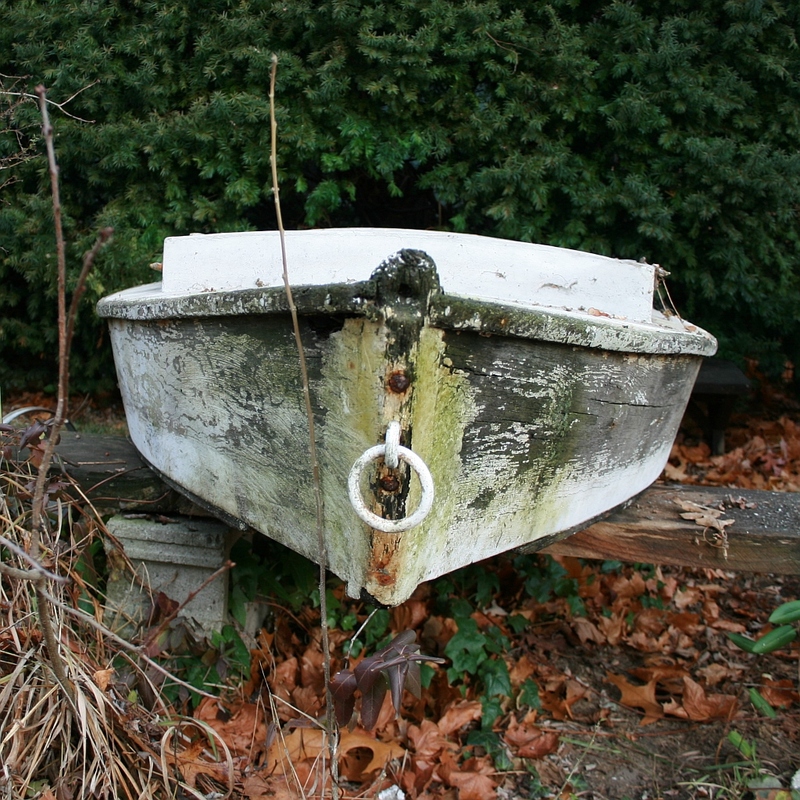 These boats – almost always made for a single occupant – proliferated throughout Great South Bay to the west and were embraced by baymen and gunners alike. At that time, Great South Bay was also home to – and perhaps the birthplace of – the battery. Market gunners used them until the sale of waterfowl was outlawed in 1918. Although the battery was always controversial – because of its effectiveness and because it also “robbed” shorebound gunners of the birds – their use remained legal on Great South Bay after the Migratory Bird Treaty Act. 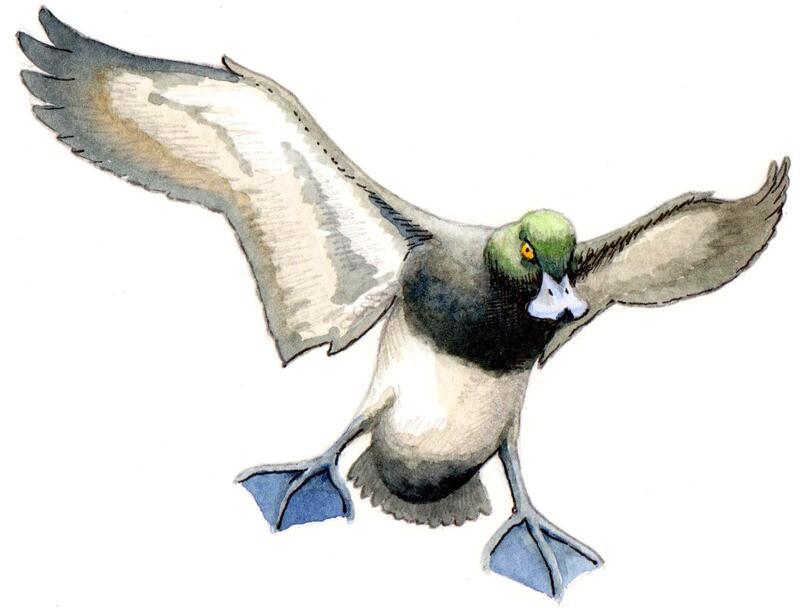 Many of the same baymen continued to use the same batteries for guiding parties of sports – for the unsurpassed excitement of having flocks of Broadbill – and Redhead, Canvasback , Brant and others – approach at eye-level and sea-level at the same time. Use of the battery itself, though, was finally banned in 1935. This spurred the use of Scooters to take the place of the battery. 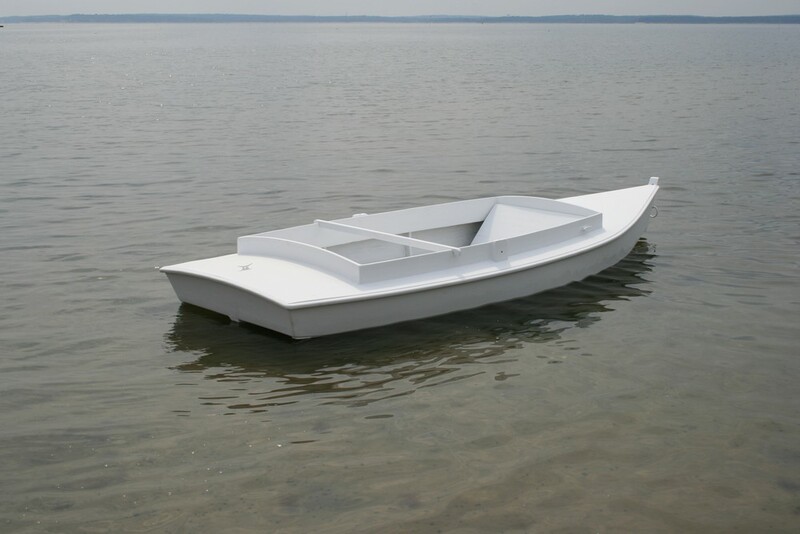 And, as with any technology, the boats became specialized for their new role. Instead of crossing ice-bound bays, the Scooter was now pressed into service as the open-water blind for gunners. As with batteries, gunners strove for a low profile and lay on their backs while waiting – and then sitting up to shoot. Some Scooters were built wider and flatter and were known as Pumpkinseed Scooters and others were built taller but with low gunwales and were known as Whaleback Scooters. Some retained their traditional white paint – to approximate the ice – and others used a shade of grey – to approximate open bay waters. 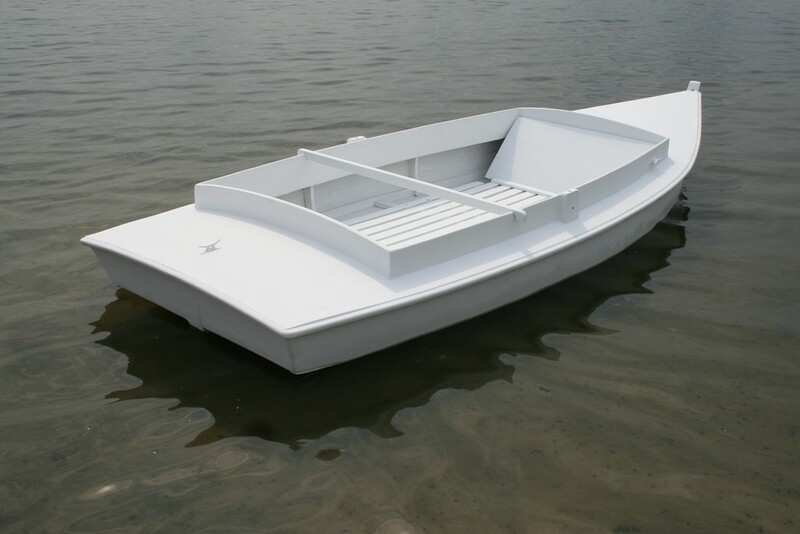 Later, other types were developed – driven especially by the advent of marine plywood and later by fibreglass. 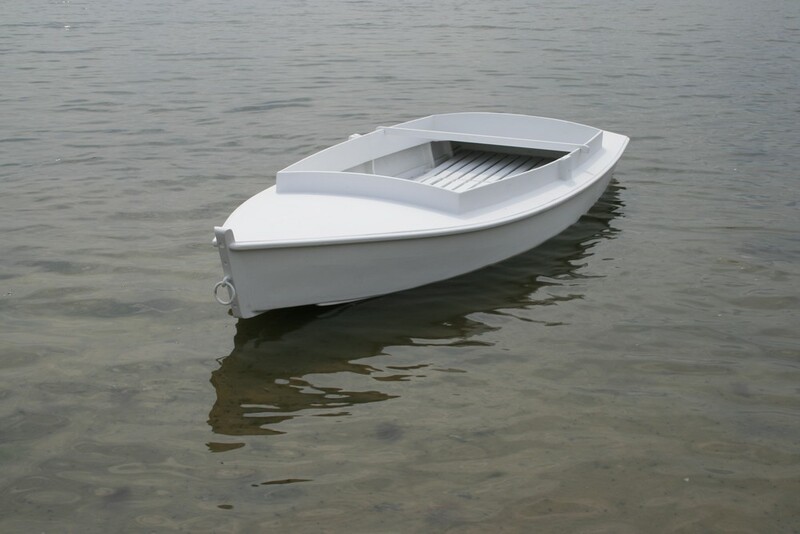 Although the naming of boat types adheres only loosely to any “rules”, most boat historians and builders would probably designate the Horal Scooter as a skiff – because of its flat bottom, pointed bow and transom stern. 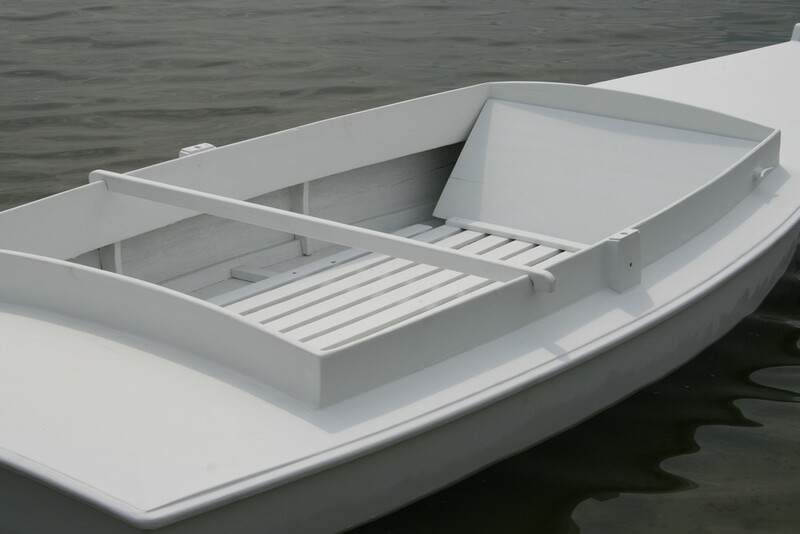 Most skiffs are not decked over – but Long Island duckboats are always enclosed except for their man-sized cockpits. Author Strung refers to the Horal Scooter as a punt in his Sports Afield story – but, in my opinion, that stems from the Bellport Bay term for their simpler duckboats; those with pointed bows, transom sterns and cross-planked bottoms were known as “punties” – as distinct from the Scooters which had round-bottoms and sometimes fantail sterns. True punts are square at both ends. In any event, the Horal Scooter campaigned successfully for many years on Great South Bay. But, as with so many wooden craft, time and the elements took their toll. Charlie Horal died several years ago; my Dad died in 2011. The Scooter now resided with Charlie’s younger son Allen – who had been 2 grades ahead of me in school. I discovered that it still existed in the fall of 2013 when I delivered the 2-man Scooter White-Wing to Craig Kessler. I had trailed White-Wing down to my Mom’s in East Islip and wanted to show it to a couple of friends before I took it out east for sea trials the next day. And so it was that I learned from both Richie Simmons and Craig that Allen still had the Scooter – and that it needed some attention. And they both told Allen that he should talk with me. 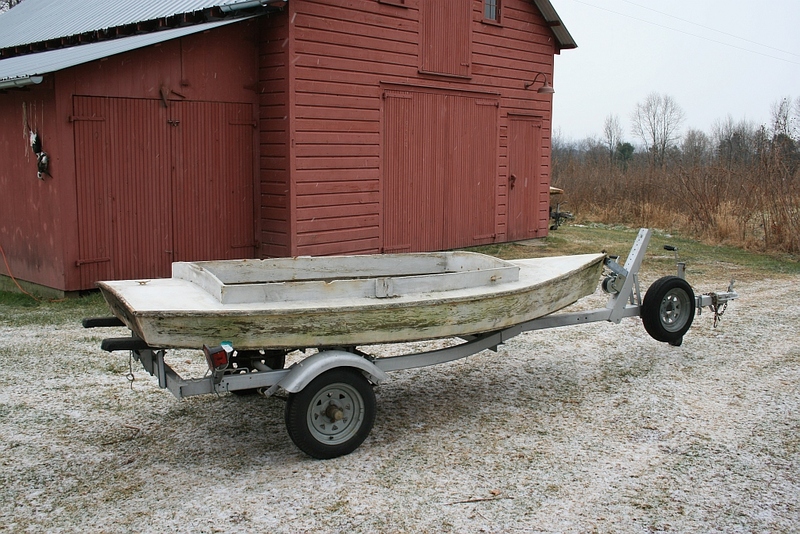 Thus, in early December that same fall, I hauled the Horal Scooter north to Pencil Brook Boatworks. Here is how she was stored – upside down and well off the ground. The skeg and the tuck-up at the stern show she was made to row – even though this boat often traveled across of the gunwales of the tender on her way to the gunning grounds. This shows her sections – a flat bottom, a bit of flare in the sides and mild crown to the decks. Several lead ingots were stored beneath the afterdeck to trim the Scooter when gunning. 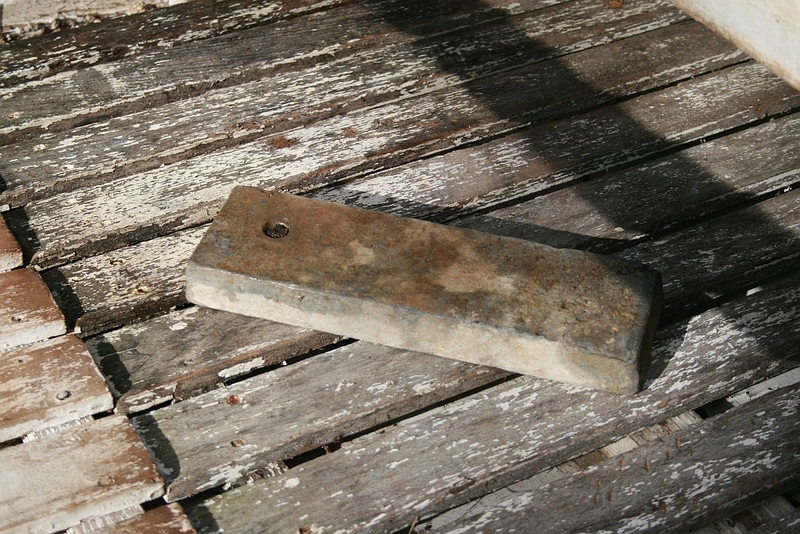 The hole in the ingot was for a loop of line – useful when handing these weights back and forth between the Scooter and the tender. I still need to measure and weigh them. The Horal Scooter arrives safely at Pencil Brook Boatworks – after about 250 miles on mostly superhighways. 1 – Here is the Broadbill’s-eye view. 2 – Not sure what’s happening beneath that tape on the transom. 3 – The outer stem/cutwater needs replacement – and you can see through the sides right beneath the rails. 4 – The oak is well-deteriorated at the fairlead through its upper end. 5 – The decks and coamings were sheathed in a “mystery fabric” – and had peeled away from the coamings in most places. 6 – All of the White Oak rub rails were crumbly and clearly past their useful lives. 7 – The floorboards, backrest and “safety stick” need only new paint. 8 – The cockpit was vacuumed out and inspected. 9 – Here she is buttoned up for the winter. The Horal Scooter was on the “back burner” while I finished out the gunning seasons – both up here near the farm and down on Long Island. In February and March I completed the restoration – and drawing the lines for – my own Scooter. 5 – A grapnel is just one way to get across soft ice. 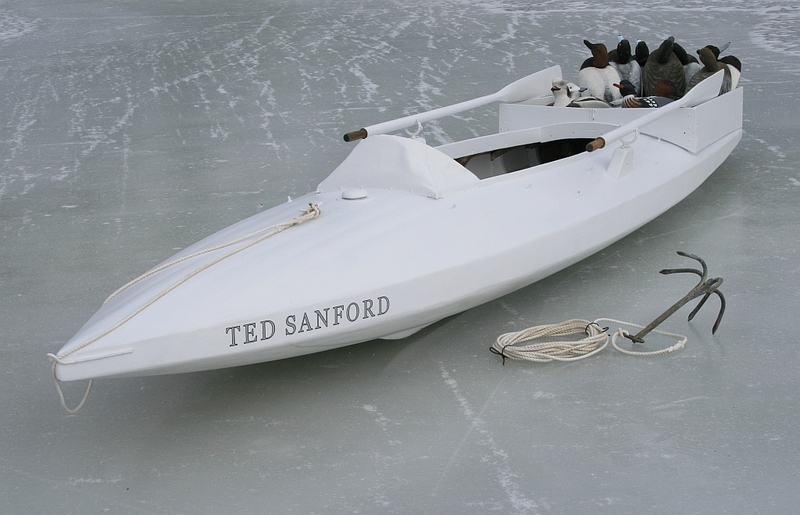 The Ted Sanford after restoration. The Horal Scooter came back into the shop and I commenced de-construction and repair. The goal of this restoration was to get her back in serviceable condition – so making her structurally sound took precedence over pure restoration to as-built condition. For example, instead of replacing the sides, I repaired them with dutchmen and fillers and then strengthened them with ‘glass and epoxy. 1 – The usual hand tools get to work…. 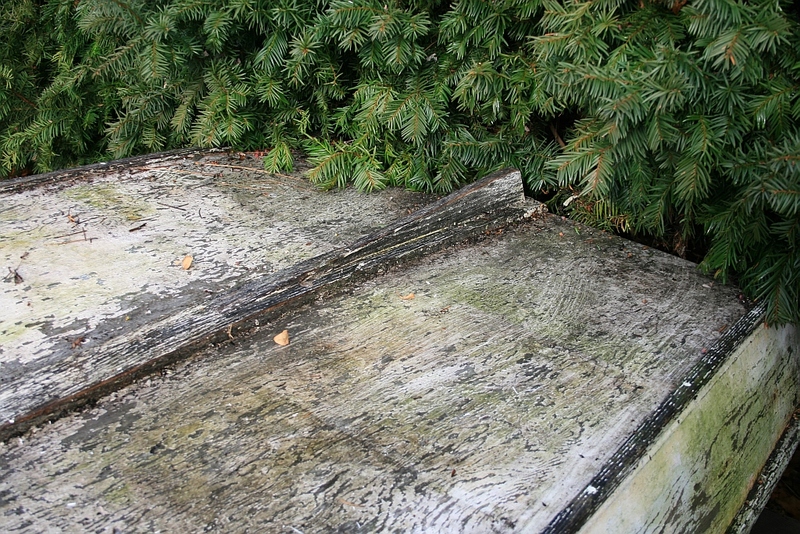 2 – The rot through the sides – probably from rainwater while stored – will be surgically removed. 3 – Yes, that is daylight shing through the many cracks in the sides. 4 – The cloth – maybe Dynel – on the decks overlaps the gunwales and ends beneath the rubrails. The rubrails are shot. 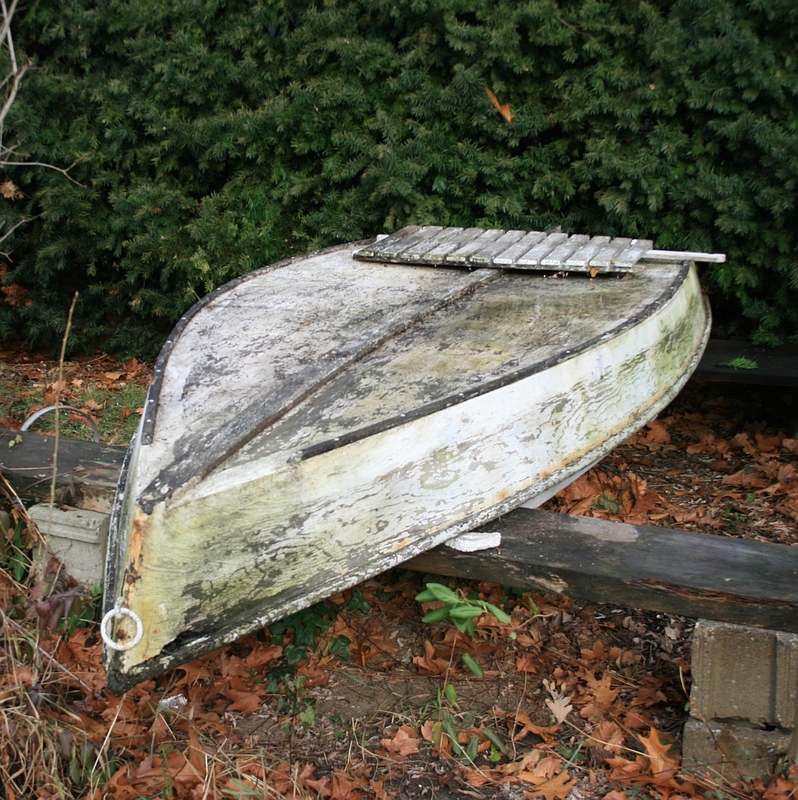 5 – The White Oak keel is also punky and past its useful life. The skeg, though, is sound. 6 – The White Oak will be replacement with treated Yellow Pine. 7 – The oarlock chocks can be saved – but need lots of attention. 8 – The sides have been cut away so the new dutchman will land on 2 frames. 9 – The outer stem/cutwater was removed, too. 10 – New pieces of Cypress and fastened with SS screws and bedded in 3M 5200. 11 – The dutchman is faired with the planer and a coarse belt in the sander. 12 – Now the bow is ready for epoxy. 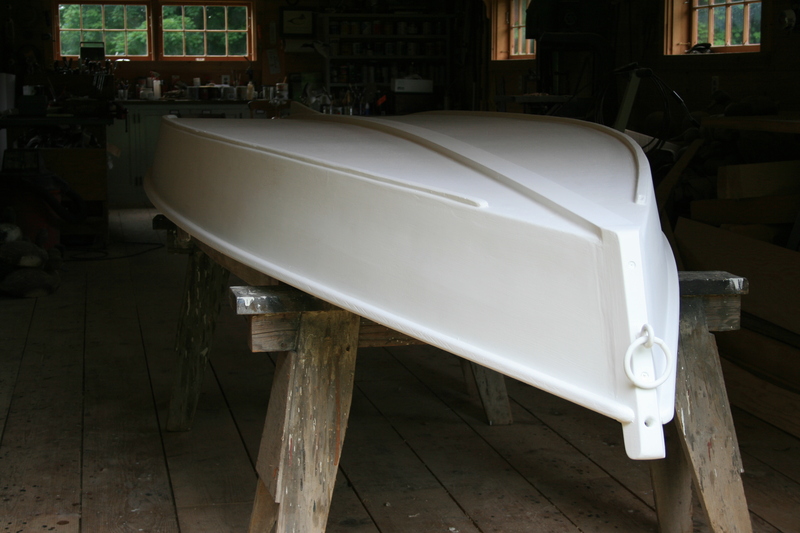 13 – The sides were first coated with straight epoxy then fillers faired the contours. 14 – The new ‘glass on the sides wrapped up over the gunwales and down below the chines. 15 – The starboard notch for the “safety stick” had broken out. I sawed it out for a dutchman. 16 – The Cypress dutchman was set in epoxy and a galvanized nail was set well below flush to reinforce the repair. 17 – I sawed a piece of curved stock from White Ash I was removing from the Pencil Brook Marina. 18 – I cut the board thicker and much wider than I needed. 19 – The new rubrails, keel, rub strips were bedded in 3m 5200 and fastened with flathead SS screws. Mineral spirits clean the 5200 nicely. 21 – Neighbor Sam Fox wriggled up under the foredeck to fasten the new eyebolt. Once everything was repaired and re-installed, the Scooter got 3 coats of flat, white oil paint on her exterior. 1 – All of my 3/8″ ratchet extensions enabled me to snug up the bow ring. 2 – I removed all of the loose fabric on the coamings. 3 – I established a lip on the fabric and made sure it was well-sealed to the coaming at its base. 4 – The oarlock stanchions (blocks) were re-bedded in 5200. 5 – The new White Oak rub rails were fastened with SS screws and bedded in 5200. 6 – The rub strips were refurbished and re-installed. 7 – Three coats of flat white oil on the exterior. 8 – I let the paint harden for a few days before flipping her. 9 – The interior received a perfunctory scraping and sanding then a single coat of the flat white oil. 10 – The floorboards, backrest and safety stick got more preparation – and 2 coats of paint..
11 – Ready to hunt! In loading the Horal Scooter for her journey south, I used a method I started using many years ago. My duckboat trailer is set up for both my Great South Bay Ice Scooter (the Ted Sanford) and my Sneakbox. With either of those boats, I try to avoid damaging their noses with the bow chock on the trailer. So, I use a “keeper” in addition to the winch cable (woven nylon strap nowadays). 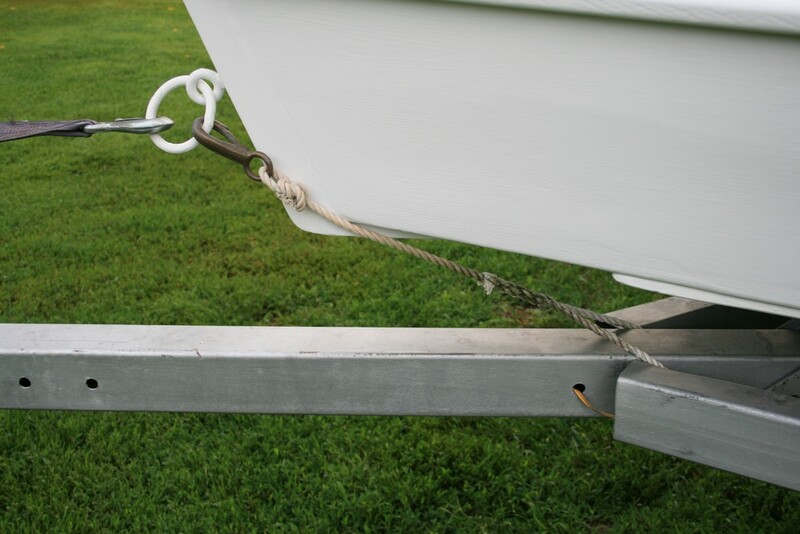 The keeper prevents the boat from moving too far forward and the winch cable puts ample tension on it. The keeper is spliced permanently to the trailer frame. With the bow snubbed this way – and 2 ratchet straps over her belly – she rode without complaint the 250 or so miles to her new home. Actually, her owner is away right now so she’s being stored at another friend’s. We switched tow vehicles for the final leg of the journey. 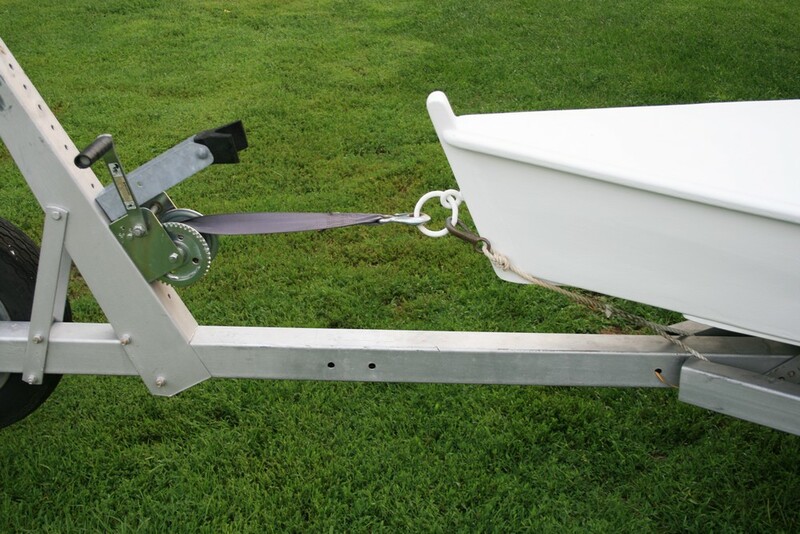 Craig Kessler has a ball hitch mounted nice and high on the back of his lawn tractor – the perfect rig to haul the trailer the last 200 feet to the water. Here she floats – probably for the first time in 30 or 40 years. I was a little anxious about one spot – where it had been repaired previously but which I did not address. Not a drop! The safety stick – stuck securely in its newly-repaired notch – keeps gun barrels up out of harm’s way. Imaginary gun and an imaginary bird – but it won’t be long now…..
Do you know who built her? I can recall seeing at least 4 of these scooters over the years. All were in the Islip area – from West Islip to East Islip. I am guessing she was built in the 1950s – almost definitely after World War II – and definitely by a skilled boatbuilder. Please let me know if you have better information about her origins.